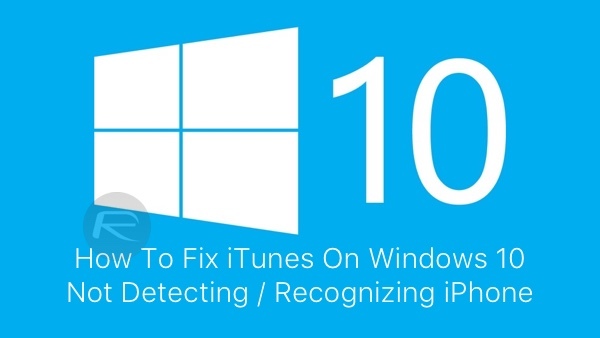 Upgraded to Windows 10 and now iTunes is not detecting or recognizing your iPhone? Is short, it doesn’t see your iPhone or any other iOS device at all? You are not alone. After the upgrade, many people are complaining that iTunes is not recognizing their iOS device when connected to a PC running Windows 10. If you have this issue, unfortunately there is no one single fix for this. You need to go through multiple checks and try them one by one to see if they fix your problem. First and foremost, reboot both your iOS device and your computer and then connect to see if this solves the problem. If you haven’t already, try to connect your iOS device on a different USB port to see if this fixes the problem. As of this writing, version 12.2.1.16 is the latest version. Make sure you have this latest version installed. If you’re having issues installing it, follow our guide here on how to install iTunes on Windows 10 the right way: iTunes Won’t Install On Windows 10? Here’s How To Fix It. 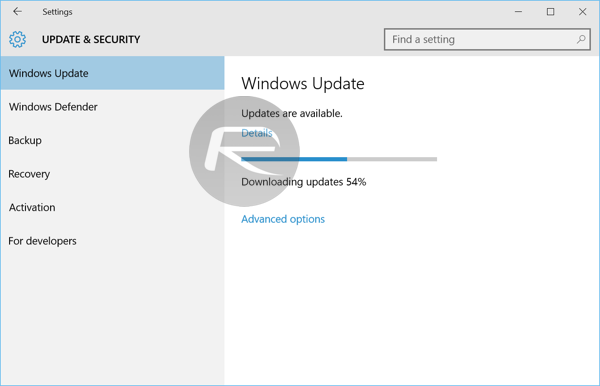 Navigate to Settings (WinKey+I) > Update & security > Windows Update and make sure your computer is up to date with all Windows updates installed. 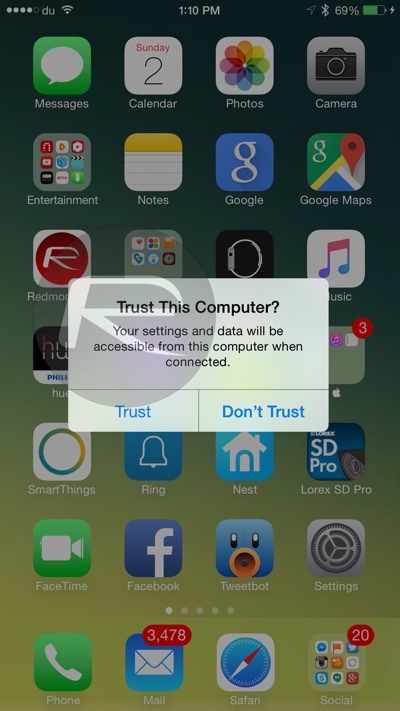 When you connect your iPhone, iPad or iPod touch to your computer and see ‘Trust This Computer?’ prompt on the device, make sure you tap on ‘Trust’ as shown in the screenshot below. 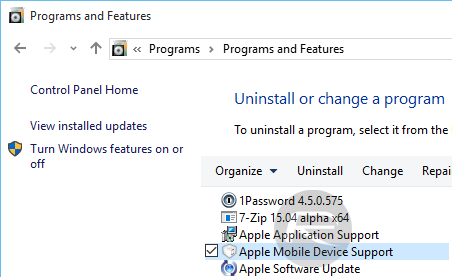 Check to see if Apple Mobile Device Support is installed from Control Panel > Uninstall a program. If it is not installed, you need to reinstall iTunes. 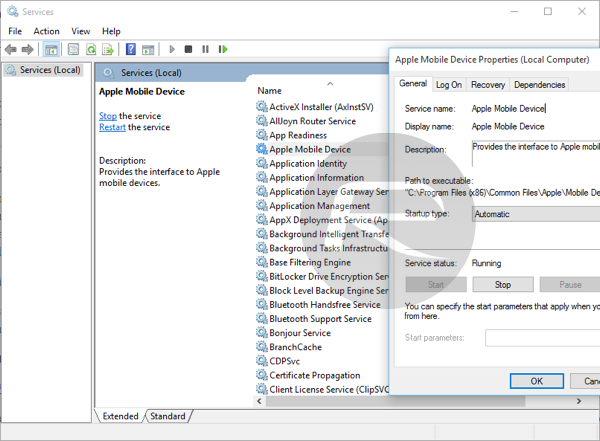 Restart Apple Mobile Device Service: Type services.msc in Run (WinKey+R) and hit enter. Locate Apple Mobile Device or Apple Mobile Device Service and then right click > Properties. Then click on Stop to stop the service. Click Start to run the service again. Reboot your computer. Check Apple Mobile Device USB Driver: Type devmgmt.msc in Run (WinKey+R) and hit enter. Expand Universal Serial Bus controllers entry and see if Apple Mobile Device USB Driver is listed. Connect your iOS device to your computer and wait for like a minute. Now right click on Apple Mobile Device USB Driver and click on Uninstall. If asked, select “Delete the driver software for this device”. 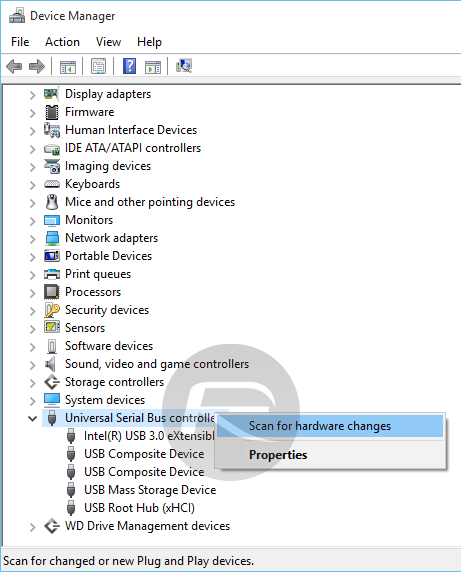 Once uninstalled, In the Device Manager window, right click on Universal Serial Bus controllers and then click on Scan for hardware changes. Windows will now automatically find and install the driver for you. If none of the above solutions help fix your problem, then it’s likely that a third-party software or driver on your computer is conflicting with iTunes and Apple’s services. You may want to do a clean install of Windows 10 on your computer to fix the problem. To do this, you can follow our guide here: How To Clean Install Windows 10 On Your PC The Right Way [Guide]. Yes! I am SO glad I happened onto this post. Thank you, sir. Thanks man, that solved it! Such an easy solution! Thank you sooo much !!! this was the only thing that worked ! Same here, your method fixed it. Thanks a bunch! You saved me! Thank you!!!! I never thought I’d make a comment on some kinda site like this, but your information actually worked. Cheers mate. It’s amazing that so many pages spout the same incorrect advice. Your solution worked. Thank You. Even 3 months later this solution still works! Thank you for sharing! This is fantastic advice! My recommendation to anyone is to look at the simple stuff first, i.e., what you can check quickly. In my case, somehow, the Apple Mobile entry under USB Serial Controller Device had been removed, and my iPhone driver had been set as MTP USB Device. Following the driver update directions to reset the USB driver to be the Apple Mobile driver fixed everything. I’m just disappointed that any program has free access to reset such critical functions, and that iTunes can’t detect that the critical config has changed. Thank you, Redmond Pie! No apple device could be located! So can’t update it. Now what? After my update to Windows 10, my iPhone does come up in iTunes, but not Explorer. All the Google searches I’ve found only deals with not showing up in iTunes, but it’s there. I’ve got many pictures and videos I can’t grab. Very frustrating. That was it! Just disabled and then re-enabled Apple Mobile Device Service. Didn’t even have to reboot the Windows 10 PC. Now file explorer recognizes my Apple 6s again. Thanks man! After sitting with the Head of IT for the last 2 hours with no luck, i found your fix. I am grateful for your post. Awesome. Spent all day trying to fix this glitch. THis worked. I guess they missed a line in their install code. same here, i was able to get to the pic using CopyTransControl but it simply WILL.NOT. show up in windows 10 as a drive anymore, and i’ve tried everything i’ve googled up. I’ve been emailing myself pics one at a time (very annoying), but videos? Haven’t figured out a method of transfer, yet. Holy cow I figured it out! Connect the iPhone when it is unlocked on the home screen. That did it! I had to restart the phone, but it worked the second time. You are the most amazing person EVER!!!!!!!!!!!!!! Thank you!!!!!!!! That’s what finally worked. Thanks! Wow, I don’t know why that works but thank you, thank you, thank you!!! Thanks, Alan. That fixed it!! I just FIXED this issue with 12.5.3 today and my iPhone 3GS (used as an ipod now) by performing a complete uninstall of EVERYTHING Apple on my Windows 10 PC. I downloaded a new copy of iTunes and reinstalled it and now my iPhone is recognized once again and I’m able to sync it. You’ve saved me hours of head scratching! Thanks so much! OK, I have FINALLY solved this problem. My iPhone 6 didn’t pop-up the “Import” pictures window when plugged in to Windows 10 OS. My iTunes would recognize my iPhone but the Windows PC (or Operating System) would not. IOW…I could not open the Apple Folder in my iPhone to see the files via Explorer (Pics, Videos). I tried rebooting PC and iPhone, reinstalling iTunes, updating drivers and all software and updating Windows but still had no luck, until I finally discovered what it was that was making the iPhone unrecognizable. Here it is: Before you Plug in the iPhone to your USB on the PC…make sure your iPhone is not “sleeping” (blank) it has to be “unlocked” first. Press the HOME Button on iPhone wait til the phone awakens and you can see the Apps on the screen. THEN…plug in iPhone to PC. You’ll hear a few connection “sounds” then you’ll be up and running. This was posted on November 14, 2016. That might of worked for you, but I did that trick up and down and still had the problem…until I discovered the real solution. You must have your iPhone unlocked before plugging in iPhone to PC. So make sure your iPhone is awake and apps are showing on the screen, then connect to PC! That worked for me finally! Dude, thank you so much. I’ve been struggling with this for a solid week. They should just replace that crap load of stuff in this article that did not even fix my issue. I did as zeehanmiralam said here and the issue is completely resolve now! Thank you so much! I’m glad I kept reading the comments to run into this fix! Much appreciated! I was going to throw this thing out the window. Thank the heavens for this guy! This is the fix! I was missing this “Apple Mobile Device USB Driver” in Device Manager. Followed his steps and bam! Works like a charm! Thank you! Thank you! Thank you!!! Thank you, this has been driving me batty – weird fix but worked. thank you so much omg ;; I was thinking my laptop was broken! Hi Karen, for the 3rd time, I deleted all reference to itunes and reinstalled it, but still was not working.. even after doing that, when I pulled it up, it showed I needed to do an update.. so clicked on “Update” AGAIN and after this update, it is now working… I actually don’t use itunes to put music on and off the phone and photos.. I use something called “CopyTrans” the one that transfers the music is free.. the one that transfers the photos back and forth is a cost (but not bad and can be used on up to 3 computers I think)… but for the CopyTrans to work, the itunes drivers have to be uptodate.. Copytrans has the itunes drivers on their site to download… I love CopyTrans much better than itunes..
try CopyTrans… it works good and their website has the itunes drivers needed .. but you do have to purchase the CopyTrans for photos.. the music transfer one is free.. I love them much better than itunes..
for CopyTrans to work you have to update the itunes drivers..